This project was made for 'Landscape for New Ohta' competition, organized by the Project Baltia magazine for AlterSPb project. The site has a vast territory, adjoining to a residential area on one side and to the Ohta river on the other. The complex approach was used to fill the territory with different functional zones. The main task of the project was to create the all-season comfortable environment with many possible combinations of pedestrian routes between functional elements, without any total space structure. Historically water resources played a great role in forming of Saint-Petersburg. The Ohta river use is very limited because it’s shallow and narrow. The new housing development on its banks is depressing the existing nature environment. To compensate this, the graphic technique imitating the river flood was used. 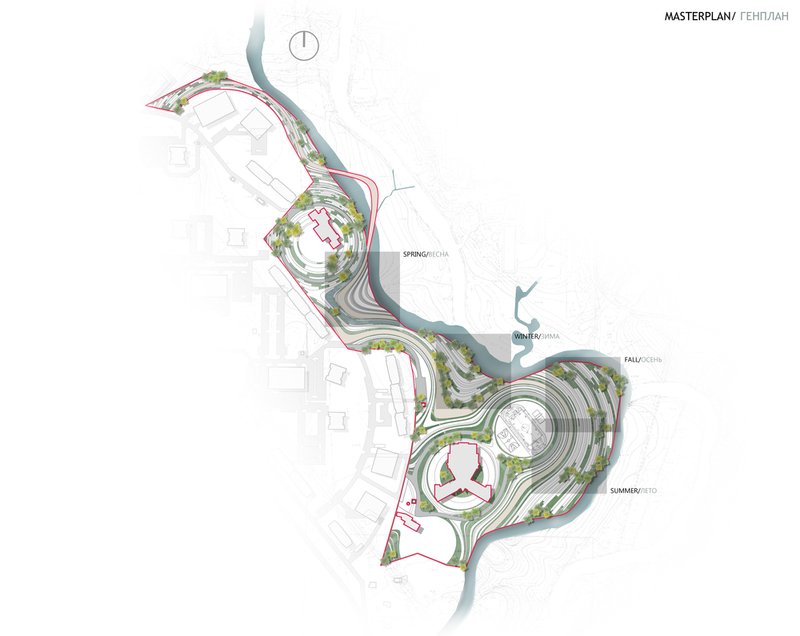 It helped us to visually enlarge the river borders and balance the buildings-nature ratio. “Artificial river” washes main zones of attraction: a mall, houses, a school, a kindergarten and parkings. 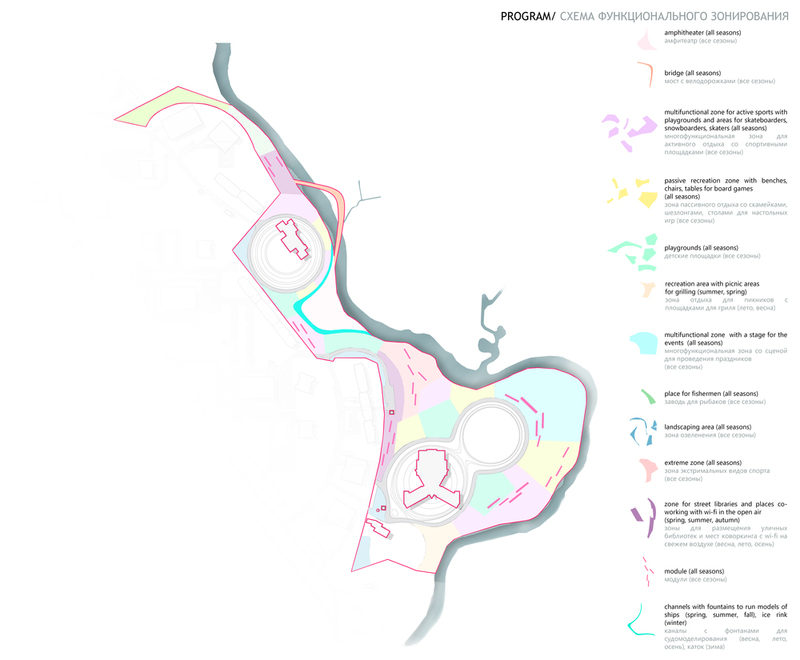 The whole territory is a pedestrian area with green plots, dividing the functional zones. The pathways are designed to propose different walking routes instead of a transit movement. The main path consists of two parts, being divided at the center, near the amphitheater. The functional zones alternate: active zones (amphitheater, fishing zone, sport playgrounds, etc.) are followed by passive zones (co-working spaces, rest and walking areas). To enhance the ways of territory usability special modules were created. There are two types of them: big modules (for cafés, libraries, shops, etc.) 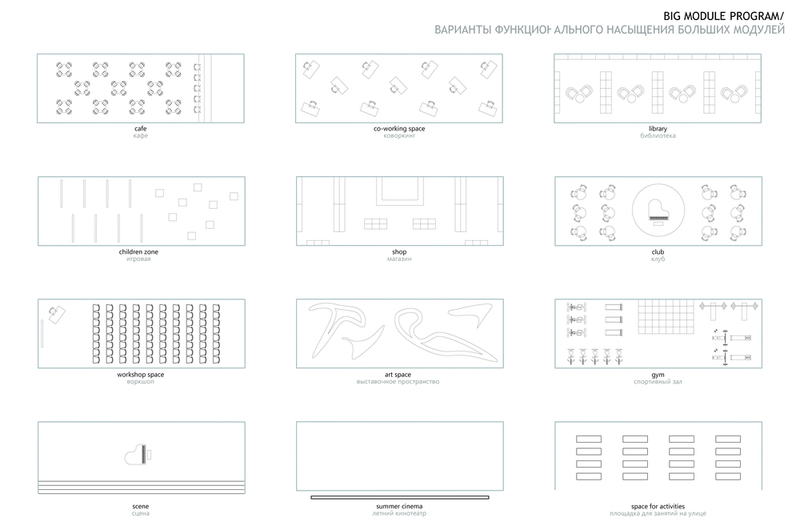 and small modules (for bike-parkings, pavilions and places to have some rest). The roof of the module can be used as a seating place, a place for skating or bmx-ing. The design of the territory creates a space of a new type, which can be changed in time, depending on the needs of the local residents.